30-day Windows Azure Platform Pass! 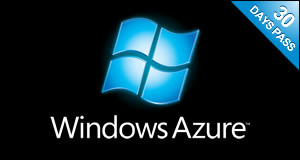 Would you like to try Windows Azure for 30 days for free? Thanks to Tony Bailey and his blog Technet, we are offering our clients the posibility to try the Windows Azure Platform with a 30 days period, without the need of a credit card! If you’re a developer interested in quickly getting up to speed on the Windows Azure platform there are excellent ways to do this. Enter here and enjoy this new Cloud Microsoft Platform!